WHEN THE COLD hard facts are laid bare, it makes for pretty grim reading. Ireland is on course to become the fattest country in Europe with nearly two-thirds of the population overweight or obese. Try as you might, there is no way to disguise it. This country is in the throes of an obesity epidemic and it has spiralled out of control. As a nation, we’re getting fatter and fatter and the graph is only going one way. By 2030, the proportion of overweight and obese Irish men and women is expected to rise to a staggering 89%. The Government has been accused of ‘failing’ the nation as a succession of reports continue to tell us little more than we already know – nothing is being done at a political level to address the biggest, and most widespread, problem this country is presently facing. Tax incentives for healthy food would help, calorie counts on menus also but ultimately, it’s down to each individual to break down the barriers which dissuade so many to change their mindset and take a course of action. Three of the most common barriers to healthy living can be lack of knowledge, cost and, most significantly, fear. The fear of the unknown, the fear of failure and the fear of veering from the norm. 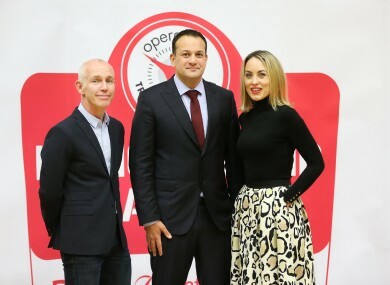 Over the last eight years, Operation Transformation has set out to break down those barriers and lead, and inspire, the nation in its campaign against obesity. Although the market is congested with ‘lose weight’ type reality programmes, Operation Transformation is different. What started out as a radio show has developed into one of RTÉ’s flagship series and has radically transformed this country’s attitude towards healthy living. Its worth, as much more than a television programme, at a time when no other institution or body is seen to be confronting the elephant in the room, cannot be understated. On Wednesday 6 January, the ninth series will begin as five new leaders embark on a journey to change their lives, and assist thousands of others along the way. “People almost wait for the show to come around the start their New Year’s resolutions,” Karl Henry, one of the show’s four experts, tells The42. “It’s become associated with that time of year. “This year we have a fantastic bunch of leaders, possibly the best we’ve ever had. They’re a strong and very positive bunch and I think the public will really associate with them over the next eight weeks. Over the years, the show has changed lives. There is hard evidence to prove it works but there is also a growing requirement for the producers to ensure the leaders represent society. This obesity epidemic is all-inclusive and no longer does it solely affect those heading towards their middle to latter years. One stand-out feature of recent series has been the presence of a young leader, in their early twenties. “The key to any show is the leaders,” Henry continues. “We get hundreds and hundreds of applicants every year and the production company need to whittle that down to get the right five. The contribution Operation Transformation has to made Irish health awareness since its launch has been unprecedented. Last year, the series was broadcast twice a week on RTÉ television, as well as radio, with 469,000 average views. Its website, where the meal and exercise plans can be accessed all year round, had over 6.4 million page views in 2015 and there were 280,000 streams of the show and extra clips on the RTÉ Player. “Operation Transformation is many things but first and foremost, it’s a television show,” personal trainer Henry explains. “It’s there to entertain, for people to follow the journey of our leaders, the highs and lows. “It’s about inspiring people and helping them do all the things others do in January. But it will always be a television show and one of the key things from an expert’s point of view is to stay true to our own beliefs and not change because you’re on camera. Presented originally by the late Gerry Ryan, and it was soon clear that there was something novel about Operation Transformation. It gives the public access to the tools and resources they need to kick-start their own journey, all free of charge. At the forefront of enlightening the nation are the four leaders. As always, fitness coach Henry will be joined by clinical psychologist Dr Eddie Murphy, dietitian Aoife Hearne and general practitioner Dr Ciara Kelly. “The show is based on reality,” Henry says. “There are no gimmicks, no fades, just solid principles involving hard work and a no-nonsense approach. “Operation Transformation is at the forefront of national health. We fight health and weight problems like nobody else. There is no Government programme like this and that’s why it’s so popular – people want to get healthier, they just don’t know how. “We’ve showed how receptive people are. We break it all down because the nation are confused about food and exercises. We fight that better than anyone else and it’s key in getting the nation moving and becoming healthier. Perhaps one of the secrets behind the show’s success is the community element to it. It’s easy to appreciate its worth when towns across the country rally together to stage daily walks and different events throughout the eight weeks. In 2015, 8,000 people took part in the 5km runs in the Phoenix Park and in Blarney Castle at the end of the programme and a new ambitious campaign is being launched for this series. The Irish Pharmacy Union will offer a free weigh-in service for those participating in the challenge at over 1,000 pharmacies nationwide while tips will be given on both television and radio. “I’m blown away by the ambition of Operation Transformation for 2016 with this fantastic initiative,” Minister for Health Leo Varadkar, said. “They are aiming high but if we all pull together as a nation I think it can be done. Next year marks the 100th anniversary of the Easter Rising, and it would be fantastic to mark that by making Ireland healthier than ever before. But for now, Operation Transformation is leading the battle against the bulge. John Conmy, Dan Kennedy, Lucy Dillon, Noeleen Lynam and Clare Scanlan will lead the fight this year. “As experts, we’re told in no uncertain terms, everything we had to do is free and cost-effective. Operation Transformation provides an eight-week kickstart for people but it’s about showing the nation that there’s nothing to be fearful about. “There are no gyms, no equipment, just workouts in the comfort of your own home and getting out in the fresh air. It doesn’t have to cost money. People work so hard and it’s my job to demonstrate the benefits of moving for free. “There is this assumption that carrying an extra stone or two is perfectly fine. In reality, it’s just as dangerous as being 10 stone overweight. We’re a lazy nation, we don’t eat properly, cook properly and don’t know what’s healthy. There’s a lot to be said about Operation Transformation and the good it’s doing for this country. It’s well on the way to creating a legacy beyond its existence and, in the grand scheme of things, is arguably the most significant television show ever produced in Ireland. The new series of Operation Transformation airs on RTÉ One on Wednesday 6 January at 8.30pm. Email “The TV show single-handedly fighting Ireland's obesity epidemic is back ”. Feedback on “The TV show single-handedly fighting Ireland's obesity epidemic is back ”.